“Your hair looks great today!” a mom said to me at school pickup. “Thanks,” I said. And then I add, “I showered,” because self-depreciation comes fast and easy. “Your kids have such cool hair,” a mom said to me on the playground. “Thanks,” I said. And then I paused because was she talking about my unkempt, scruffy, and desperate-for-clippers kids? “The secret is infrequent showers and no haircuts,” I said because self-depreciation comes fast and easy it was the truth, which got me thinking. Maybe I actually know a thing or two about having kids with "cool" (i.e. wild) hair. Here’s my advice to any moms looking to up their kids’ hair game. Say YES. So, your kid wants a mohawk. Or, blue hair. Or, pink hair. Or, blue and pink hair! There are so many reasons to say no our kids. Don’t let their hairstyle be one of them. Unless your kid asks for a perm. Then, you have permission to say “no” with gusto. Embrace apathy. Schedule haircuts only as often as you go to the dentist, change your smoke detector batteries, and/or change the clocks (i.e. no more than twice a year). The more time between cuts, the cooler the hair. Make it hard. If your kid really wants purple (or pink or green...) hair, describe the 27 billion-step process involved in cutting, bleaching, and coloring hair. Don’t miss a single detail, and be sure to include a vivid description of the life-depleting waiting that happens in between each step, the spotty WiFi in the salon, and the swim cap that will be required to keep chlorine from washing out the vibrant and expensive AF color over the summer. If your kid still wants to do it, see #1. Don’t overthink hygiene. Red carpet worthy bed head happens when your kid goes to sleep with wet hair or when your kid goes to sleep with hair that hasn’t been washed in days. Either way, evidence of shampoo use is purely circumstantial. I don’t know what my tweenaged son is doing in the shower besides practicing Fortnite dances, and I’m okay with that. As long as I can’t smell him across the room, we’re good. Keep your hands to yourself. No matter how badly you want to run a comb or your fingers through your kid’s insane mop each morning, don’t do it. Look for your cold cup of coffee instead. Listen. 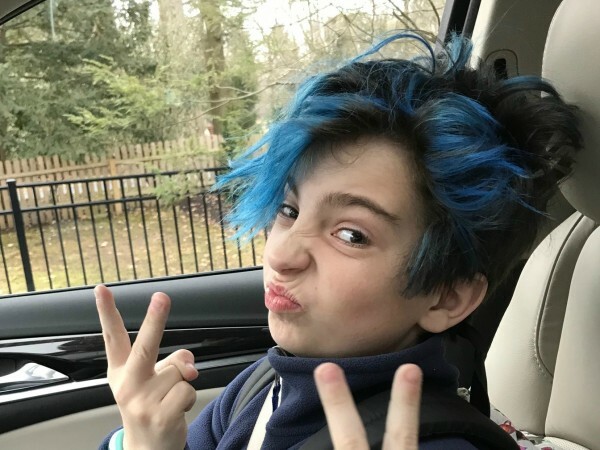 Not to the people who question your parenting chops because you said “yes” to blue (or fill in the blank) hair, but to the people who think you’re awesome for letting your kid express himself, explore himself, and be himself. Jen Gregory is the writer behind the blog, The Runaway Mama. She wouldn’t want to be anywhere else except home raising her two boys, but like the little bunny in Margaret Wise Brown’s classic book, she sometimes wants to run away.